The 2018 Annual General Membership Meeting will be held at the Delta Armouries Hotel on October 26-28 in London, Ont. Please join us for the Great Lakes Cruising Club and the Great Lakes Foundation 2018 Annual Membership Meetings this October. The venues for this years AGM Meeting are exceptional as they have an historical presence in the city of London and a reputation of exceeding expectations. On Friday, the Delta London Armouries Hotel will welcome you with its unique architecture and appreciation of history and modern luxury. Friday’s dinner will be a Deluxe Buffet at the Delta. 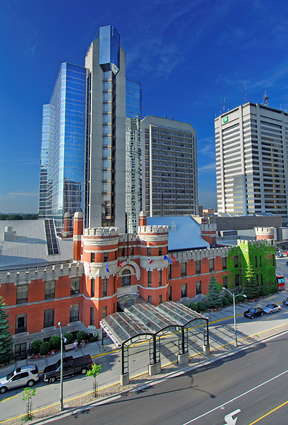 The Delta Armouries is ideally located in the heart of downtown London near shopping and several ethnically diverse restaurants. Click here for more information, agenda and registration. We look forward to seeing you there! Let's welcome Bill Bailey as the newly appointed Port Captain for Elk Rapids, Mich. (M-7)! Bill is a retired teacher who spends his summers onboard Cavalier in Elk Rapids while not cruising to the many harbors, and his winters skiing. He started sailing over 30 years ago on a Hobie 16 and enjoyed competing in CRAM (Catamaran Racing Association of Michigan) races for a few years. His current boat is Cavalier, a Freedom 32 that he purchased in Huntington, N.Y. He sailed her from Long Island to Bay City, Mich., and has been cruising the Great Lakes ever since, having sailed all except Superior. Please click here to read more. Charles' Final Journey (video courtesy of Adam Mastis): Friends and loved ones gather for the release of GLCC Past Commodore Charles W. Brittan Jr's ashes off the bow of fellow Past Commodore James C. Achesons' boat Lady J. GLCC Chaplain Nelson Stone presided with a commending eulogy. 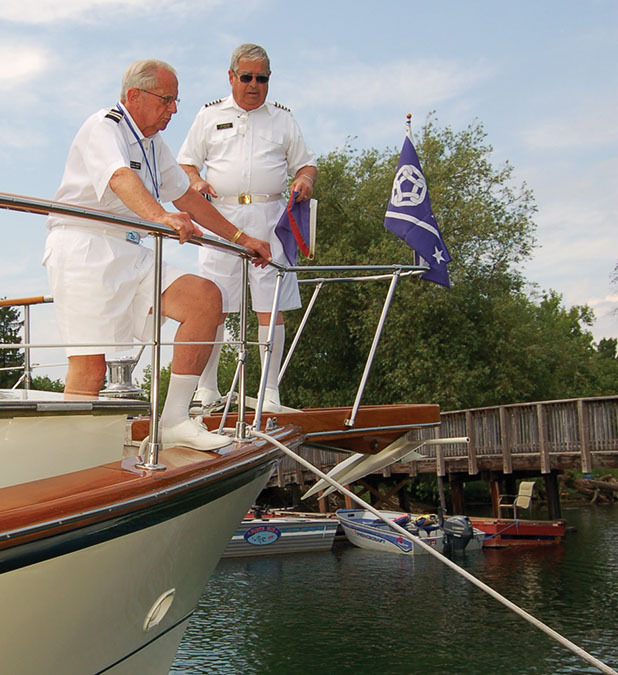 Charles served the Great Lakes Cruising Club membership for 17 years, from 1963 until 1984, as a Director, Treasurer, Rear Commodore, Vice Commodore, Commodore (1980-1981), and finally again as Director as well as Past Commodore in 1982-1984. He was a long-time resident of Illinois and retired to Belleview, Fla., where he resided with Sue Meyer. Please click here to view the video on YouTube. Fall 2018 Lifeline Now Available! Fall Lifeline — it's here once again, commencing the official end of summer. Soon we'll be stashing our boats and making preparations for the coming of winter. 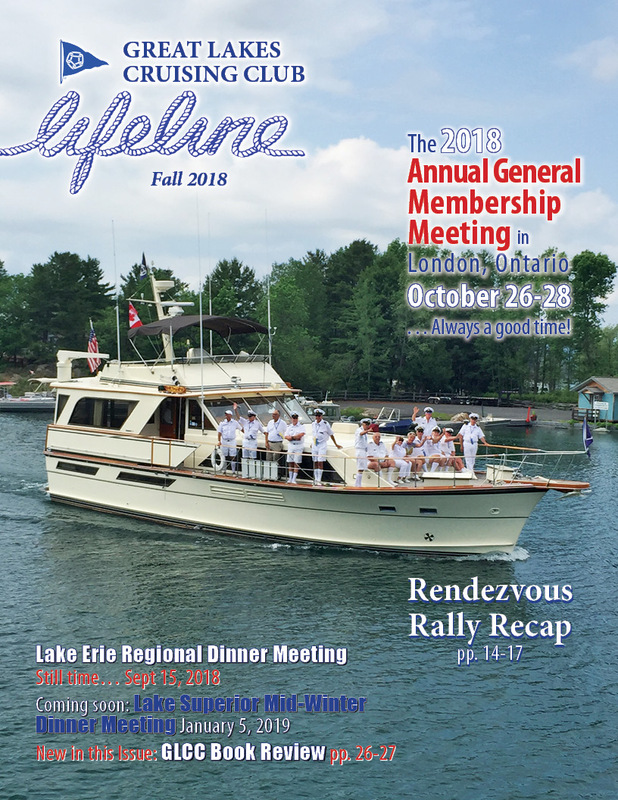 This fall issue of the Lifeline promises some good reads while looking back at the wonderful memories we've made around our Great Lakes. After the Rendezvous article and centerfold, Lifeline boasts the conclusion of Dave & Colleen Wray's Founders Award log. Port Captain Pat Somers wrote an informative book review on The Death and Life of the Great Lakes by Dan Egan. Remember to check out the 2019 Boat Show Schedule on p. 4 and a few save the dates — some fun events to look forward to in the non-boating months! Click here to access the 2018 fall Lifeline magazine, and here for updates and information on GLCC Events. 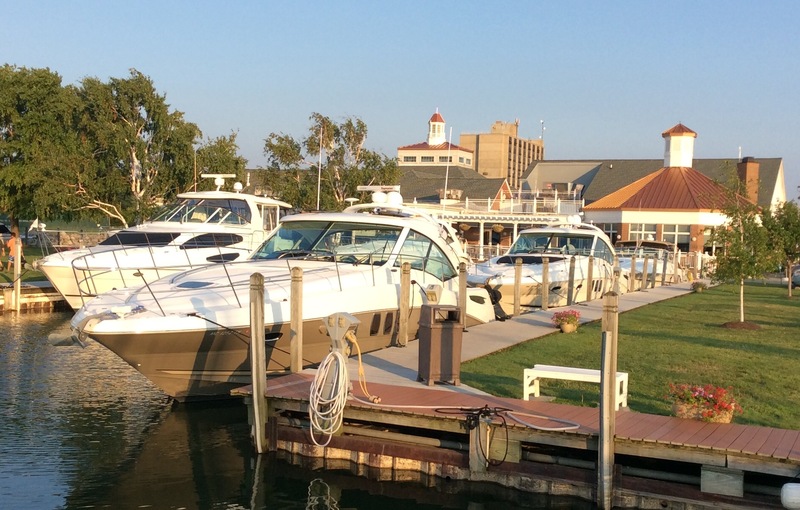 GLCC Members and guests are invited to attend the 47th Annual Lake Erie Regional Dinner Meeting at the Sandusky Yacht Club, Sandusky, Ohio (E-16) on 15 September 2018. There will be a cash bar, USD and credit cards for social hour at 1800 at the A-Dock pavilion. You are sure to enjoy the buffet dinner at 1900 with a choice of slow-roasted Prime Rib, paired with fried Lake Erie Perch, Chicken Marsala, Green Beans Almandine, Herb Roasted Redskins, Veggie Pasta and dessert of cheese cake and other sweets. Coffee, decaf, tea, or iced tea, all for only $50 USD per person. Please click here to read further.